Faces and Forms Across Time is a book of 112 drawings and paintings representing Jindrich (Henry) Degen’s artistic endeavours over the last three decades. This collection contains real-life portraits as well as images and portraits based on the works of other artists. Some of the works in the book are the product of Jindrich’s own imagination. In addition, there is a section containing icons and symbols and two sections picturing animals (domestic and wild). Portraits and life studies are only one aspect of Jindrich Degen’s multi-faceted art repertoire. For his other art forms, visit his website www.henrydegen.com. See also related art books Colour and Contrast and Artistic Inspirations. 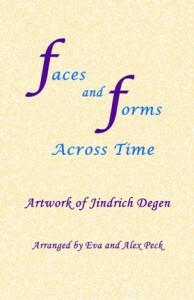 Faces and Forms Across Time is available at Amazon and other online outlets. Australian readers may find a better value for Faces and Forms Across Time at Fishpond, which sells discounted books and sends them postage-free. Also available as a free e-book (ibook) for a download at https://itunes.apple.com/au/book/faces-and-forms-across-time/id698062827?mt=11.